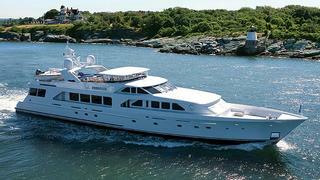 News in overnight from Yachtzoo of a $800,000 price reduction on the 43m motor yacht Bri. Built to ABS class by Christensen in 2000, an elegant mahogany interior includes a large saloon with formal dining area and accommodation is for eight guests in a full beam master suite and three double staterooms. A spacious flybridge features a refrigerator, icemaker and barbecue along with sun pads and a hot tub. Twin 1800hp MTU engines give Bri a range of 4,000 nautical miles. Lying in Fort Lauderdale, Bri is down from $7.75 million to $6.95 million.